My grandmother used to say that having a cemetery close to home was not a problem at all, but something good: their tenants do not make any noise, they have no complaints and it is very unlikely that something else is ever build there that might disturb you. 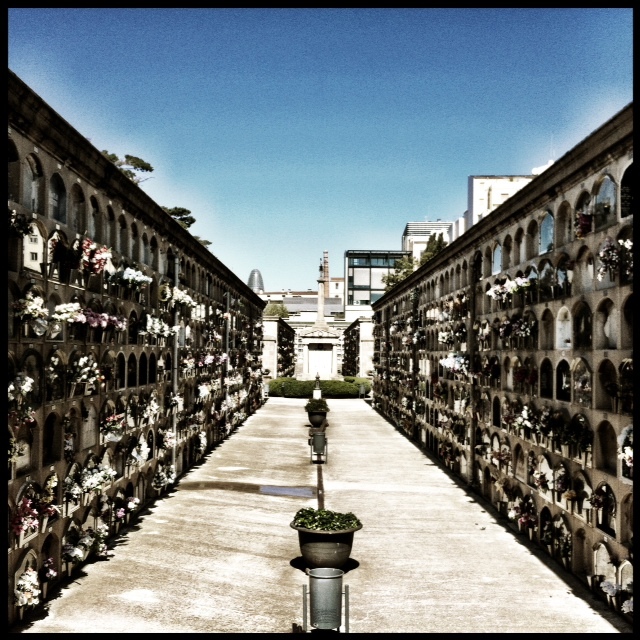 Poble Nou Cemetery is the oldest in Barcelona, ​​although it was at first out of town. It was developped because there was the need to bury the dead outside the walls of the city, when Barcelona was still walled and lacked space and hygiene. Now, however, this cemetery lays in the middle of the city, and tenants have many neighbors who seem to have no complaints. There are many famous Barcelonians buried in Poble Nou, such as the musician Josep Anselm Clave and the politician and engineer Narcis Monturiol or the actress Mary Santpere. But the niche that is the most visited belongs to Francesc Canals Ambrós. It gets so many visits that they had to empty the twelve niches around his to make enough room for the amount of gifts and flowers that he receives. Francesc Canals, known as "The Santet", was a humble boy from Barcelona who died at age 22, victim of tuberculosis. It is said that this young man, who was reputed to have powers of divination, is now able to intercede for miracles or favors (other than economic). If you want to ask a favor to Francesc, you have to write the wish on a paper note, send it through the glass of the gravestone, say a prayer and go down the right side and not look back. Do not say I didn't warn you. It is nothing new to say that the differences between the original Plan Cerdà for Barcelona and how the city was finally urbanized are more than remarkable. In fact, even though the locals are now proud of our orthogonal Eixample and can not imagine the city with any other street design, the truth is that the Plan Cerdà was not very appreciated by the people from Barcelona at that time, even less among the middle classes. Thus, one of his ideas was to leave the central areas of the blocks free of buildings, in order to install gardens, usually as "corridors" between two parallel strips of houses. It goes without saying that the block interiors were filled with buildings, often family workshops and small factories, and eventually ended up joining the two strips, closing the blocks completely. And this way was, very briefly, how it was born another typical landscape of Barcelona's Eixample: what we see from the windows overlooking the courtyards in the Eixample. The good news is that in recent years the City Council is making an effort of recovery of these gardens, and there are 44 block interiors recovered, open to us all. The bakeries of Barcelona are always full of different types of candies depending on the season. Among others, there are the Lent fritters, the Sant Joan "coca", panellets for All Saints´ Day... 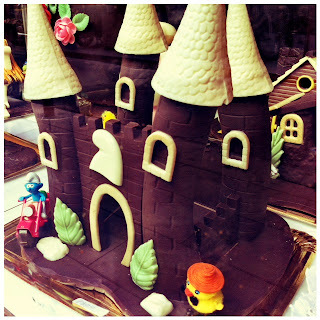 But perhaps the king of them all (or rather, the Queen) is the Easter cake. For anyone who likes chocolate, walking past a bakery these days can be a delight. Tradition says it is the godfather or the grandfather who gives it to the godson for Easter. Initially it was a simple dough made ​​with sugar and other sweets, always topped with boiled eggs. Generally one put as many eggs as the age of the child, until age 12, when he made the Holy Communion. But with time Easter cakes evolved and natural eggs became chocolate eggs, and Easter cakes were eventually made basically of chocolate. Now we find truly wonders, and must also follow fashion trends each year (although the issue of the Smurfs, such as the one in the photo, is a classic). Particularly, I have to say I never was very fond of chocolate myself and also my godfather didn't give me my "Mona" because it is not a tradition in the Basque Country...but that does not mean that I stand in front of the bakeries to look at them!